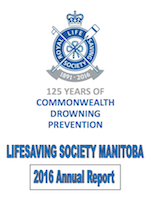 The Branch’s Annual General Meeting takes place in March, and all Lifesaving Society members are invited. If you are a Lifesaving Instructor, Examiner, Trainer or National Lifeguard and 18 or older, you are a voting member of the Branch and can attend to stay informed about what your Society is doing. Watch the home page early each year for the date. In the meantine, read about updates and highlights for the previous year in our Annual Report.